Big, juicy hamburgers veggie burgers and buns–they go together like peanut butter and jelly, right? So how rude of me to give you a veggie burger recipe, even if it is the juiciest, most satisfying veggie burger you’ve ever crafted, without the recipe for an equally over-the-top fluffy sweet potato roll to sandwich it. 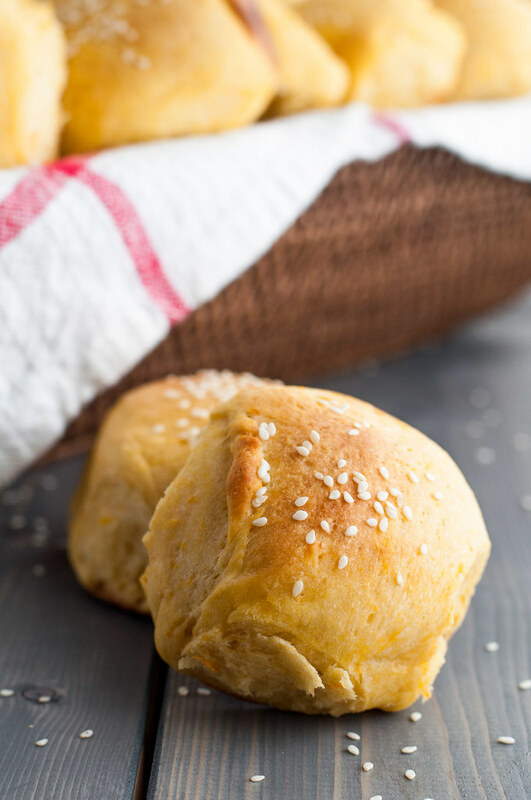 A roll that I have no problem biting into fresh out of the oven with its buttery top and slightly sweet interior, but that becomes absolutely irresistable after it’s sliced in half and toasted up in a cast iron skillet slicked with real deal butter. A burger bun to absorb all those saucy, mushroom-y burger juices, saving you maybe one, or possibly two, of the five napkins you’ll need. How dare I deprive you of such a recipe? Today, though, I’m here to make amends. I’m not a robot, and sometimes I forget to do [crucial] things, like write down the details of a new recipe, or move my clean, very wet laundry to the dryer in a timely fashion. Without fail, the recipe (sadly, not usually the laundry) turns out beyond my wildest hopes and dreams and then I have to go back and try to piece it together, which becomes even more difficult if there was a glass of wine assisting me. 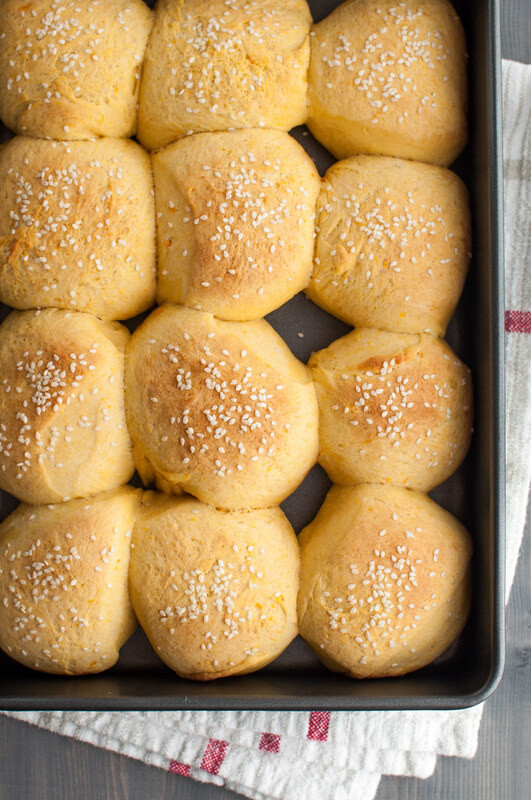 On the other hand, re-testing these sweet potato rolls justifies eating another three of them with dinner tonight and gives me the chance to take some super scrumptious looking pictures. The buns got a little jealous when I photographed them with the burgers, because everyone, including me, kept drooling over those BBQ drips and oozing melted cheese. Can’t blame us. As you may have perceived if you’ve read a few posts, I’m very thorough. Call it perfectionism, if you will. Either way, that attention to detail which served me so well as an accountant for many years is absolutely driving me up a wall about the way the top half of this roll looked kind of dry, no matter what I did to it in post-processing. Can’t hide the truth–it was a little dry. 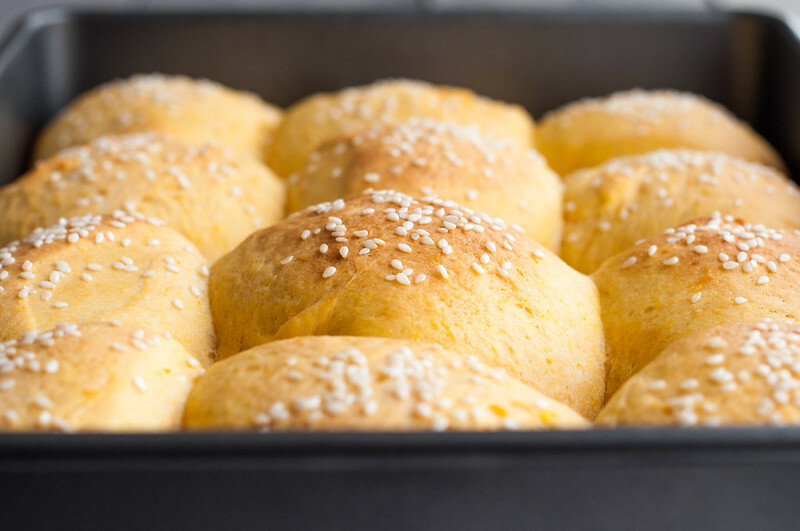 I use a few tricks now and again, but rather than hit that slightly powdery roll with a little olive oil spray to spruce it up, why not actually make the rolls glossier, with a little brush of divine smelling melted butter just before baking? If you literally used up your last three tablespoons of butter in the recipe, my research predicts that a beaten egg, egg wash, or even heavy cream will impart the same sheen. And if you’re in a hurry and taking these to a party, there’s no harm in skipping the butter/wash entirely. My research also predicts that burger lovers will be so enamored with this bun that they won’t, like my picky self, have time to analyze the gloss factor of the puffy top. I think it’s evident by now that I’m feeling about a million times more alive than when I wrote about this chard gratin–hello usual wordy self. Two days of rest has a way of reviving any writer’s burnout that had accumulated. So what exactly is the point of eating a flour-packed roll when my burger or stew is gluten free? And what’s with my lackadaisical attitude toward gluten these days? Isn’t wheat flour the devil?! In a word, mostly, yes. Especially modern wheat flour. However, my nutrition philosophy is never static. I’m always experimenting, keeping in mind balance and little to no processed food. I especially focus on eating tons of fresh produce, so there’s just not room to eat bread or pasta three times a day (or even three times a week) as I fill my plate with greens, whatever seasonal fruit I can find, beans, rice, nuts, and potatoes. And yes, often some cheese. That said, homemade bread, in quantities my tummy can handle, strips this crazy, busy, modern life down to simpler roots for an hour or two. There are no big industrial machines kneading my loaf (just my Kitchen Aid on occasion), and I bake only a pan or two at a time, as needed. It gets eaten all too quickly rather than sadly idling on a supermarket shelf. 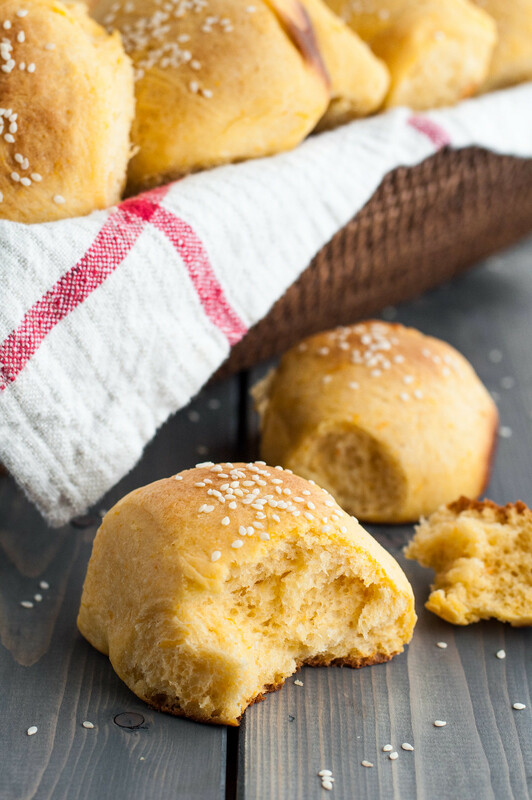 If you voluntarily avoid gluten or usually buy your bread ready-to-go (and if I need breadcrumbs fast, that’s exactly what I do), try making these simple rolls or an easy loaf just once every month or two with the best ingredients possible. Aside from feeling like a Little House on the Prairie hero, I think you’ll be met entirely with satiety, pride, and straight up bliss. Let’s call it guiltless gluten. To view, save, or print the recipe without pictures, click the “Print” button. 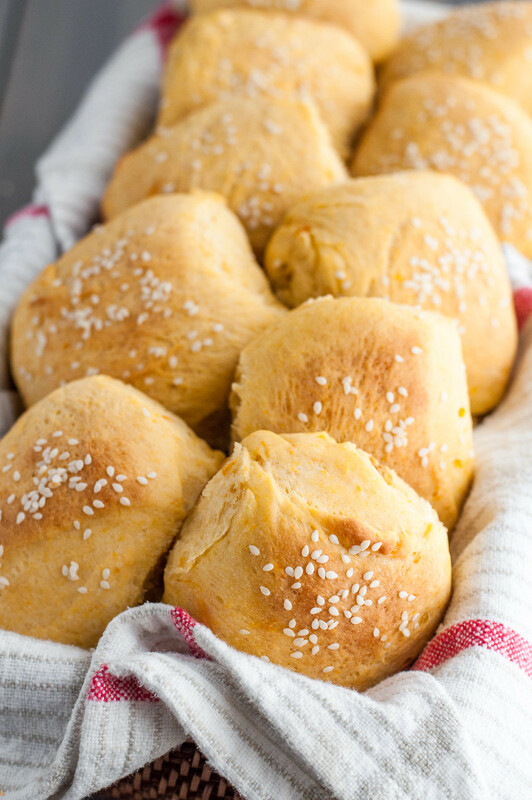 Sweet potatoes bring natural sweetness to these fluffy dinner rolls or burger buns, and melted butter gives the crust a delicate crunch. Preheat oven to 400 degrees (F). Scrub and dry sweet potato and pierce skin in 6 to 8 places with the tip of a paring knife. Bake in a foil-lined pan until easily pierced to the middle, almost an hour. Halve lengthwise and, when cool enough to handle, scrape out flesh. Puree in a food processor or blender. Measure ½ cup of puree for the rolls and save leftovers. 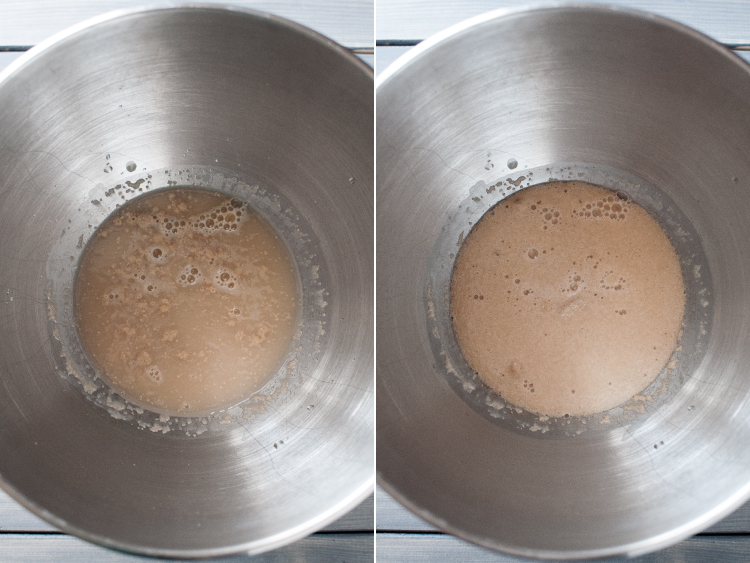 In the bowl of a stand mixer, stir together yeast, 1 tablespoon sugar, and warm water with a spoon. Let stand 5 minutes, or until the yeast looks noticeably bubbly and smells "yeasty" (difficult to describe, easy to detect). Fit the mixer with the whisk attachment. 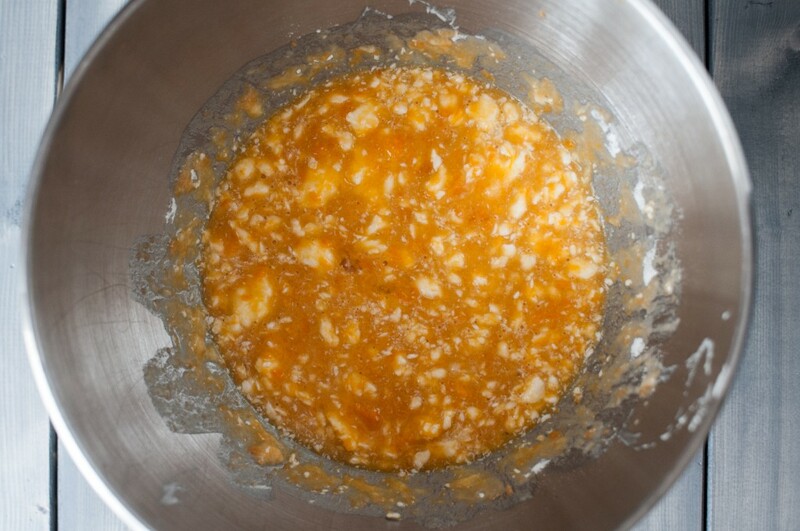 To the yeast mixture, add 3 tablespoons sugar, the half cup mashed sweet potato, 3 tablespoons butter, the salt, ¼ cup flour, and both eggs. Whisk on low until well combined (butter should be broken up). Add 3¼ cups flour and mix with the dough hook on low speed until all the dough is wrapped around the hook in a smooth mass (about 2 to 4 minutes). If some flour settles in the bottom of the bowl, stop and stir, and continue mixing so it incorporates. Pinch the dough with your thumb and a couple fingers. If it's very sticky and stays on your finger (or if it won't form a mass around the hook on low speed), add ¼ cup flour and mix again until the dough is smooth (I usually add the extra flour). Gently scrape the dough off the hook. Pour vegetable oil down the side of the bowl near the bottom, then turn dough with your hands or a rubber spatula to coat the ball. Cover tightly with plastic wrap and let rise in a warm place until doubled (60 to 90 minutes). Punch the dough down once (firmly, with a fist, but not like you're trying to knock it out). Let rest 2 minutes while you lightly grease a 9 by 13 inch pan with ½ tablespoon butter. 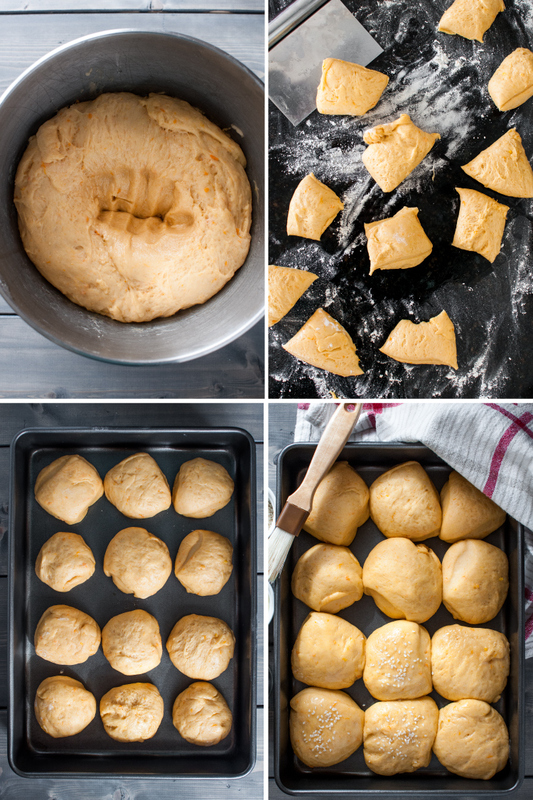 Turn dough onto a lightly floured cutting board or countertop. Cut into 12 approximately equal pieces and pat each into a ball, then use the pinky edge of both hands to pull the sides down and tuck them under the bottom, creating a smoother top of the roll. Arrange balls in rows in the pan, cover with a dry dish towel, and let rise again in a warm place until doubled, about 30 minutes. Preheat oven to 375. 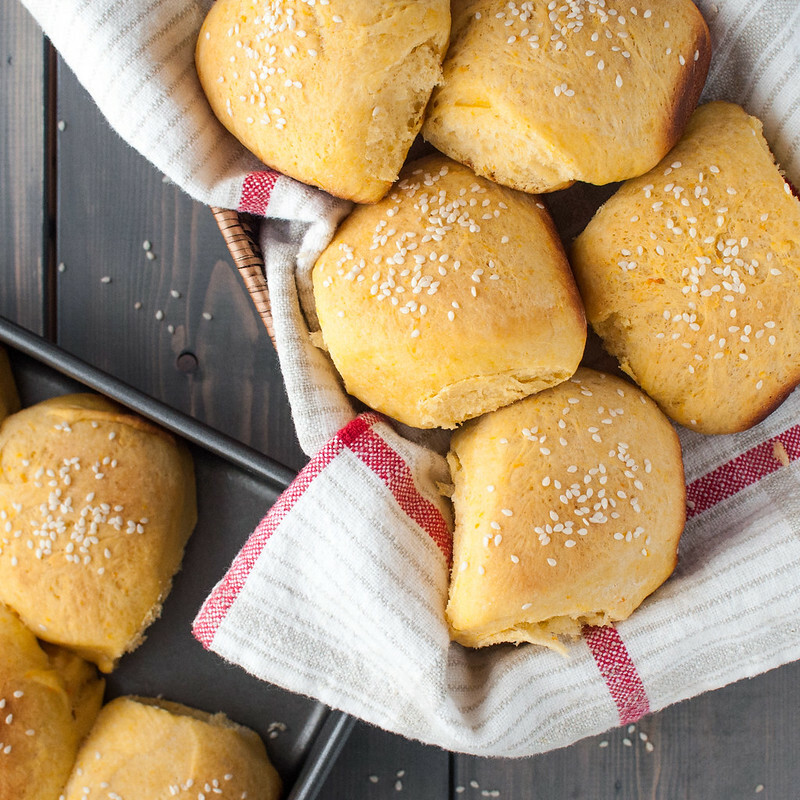 Melt remaining ½ tablespoon butter and brush a thin coat over the risen, unbaked rolls. Sprinkle with sesame seeds and sea salt, then bake until light golden and crusty on the outside, about 16 to 18 minutes. Serve warm or at room temperature. Rolls keep, sealed in a plastic bag, a day at room temperature and another 2 to 3 days in the refrigerator (although don't plan to pass them off as fresh! They become slightly more dry and chewy, which can be disguised if toasted.). Active prep time is about 45 to 50 minutes. Baking versus boiling (or another cooking method) the potatoes affects the moisture content. To keep quantities of other ingredients the same, do not boil or otherwise cook the potatoes, and, once cooled, remove skin and mash immediately. This allows steam (i.e., moisture) to escape. 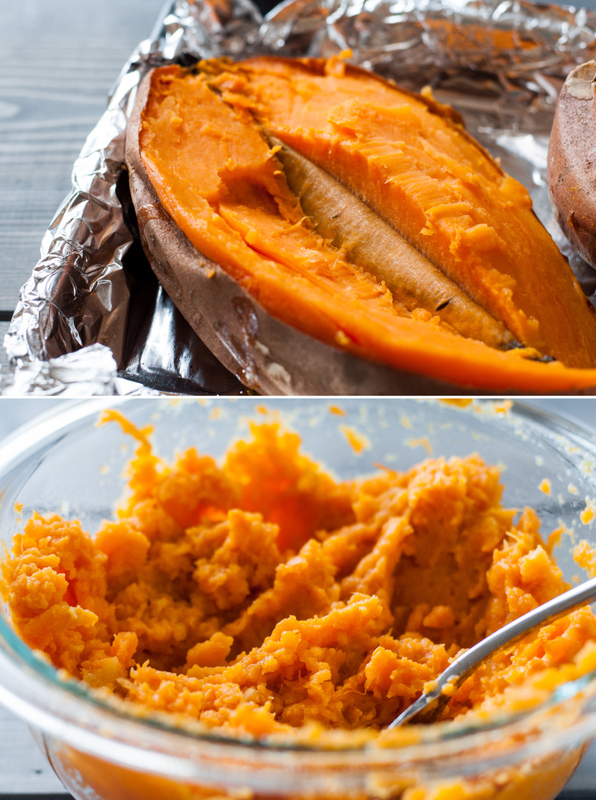 To speed up the process, prepare the sweet potatoes in advance and refrigerate until needed. 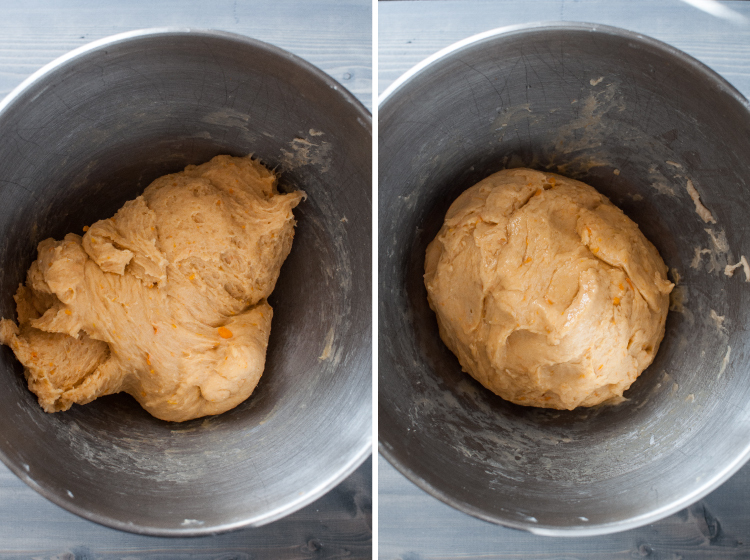 Bringing the sweet potato puree closer to room temperature will encourage faster proofing (rising) of the dough. Got left over sweet potato? It's excellent for the next day's lunch, warmed up and mixed with a good amount of salt, plus butter, olive oil, avocado, or sour cream. Some lime juice is also a good addition to offset the sweetness. If water is too warm, it can "kill" the yeast. If you don't have a thermometer, err on the side of just more than lukewarm. Worst case scenario, the yeast takes a little longer than prescribed to activate, but it should still happen if you're patient. This page contains affiliate links. It does NOT contain sponsored content. Affiliate links (to products I recommend, on Amazon) offset my ingredient and website maintenance costs, so I can keep bringing you fluffy recipes like this one. Thanks! Black bean burgers are some of my favorites and paired with these homemade buns sounds like perfection! And my husband adores sweet potatoes in any form. 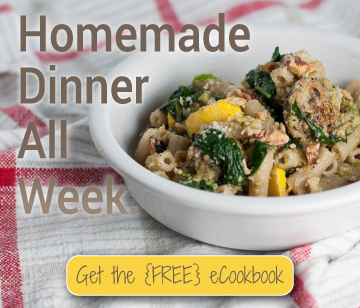 I am visiting from Simply Fresh Dinners today and happy to have found your blog through it. Your recipes look amazing, fresh, healthy and delicious. Could I substitute the flour with Coconut, tapioca, or Almond flour? Amy, with yeast bread recipes, I wouldn’t recommend 1 for 1 substitutions of other GF flours. Nicole at Gluten Free on a Shoestring has TONS of amazing bread/roll recipes, and that’s where I usually turn when I’m doing GF breads.